Early on in her career, Sian Owles recalls feeling unsatisfied: like many LGBT+ lawyers, she spent a lot of time and energy concealing the fact that she was gay to all but a few colleagues. Owles’ experience is not uncommon. According to 2018 YouGov research, last year 35% of LGBT+ people in the UK had hidden their identity whilst at work for fear of discrimination. But if young professionals attempt to mask their behaviours and mannerisms, rather than focus on being themselves when they start their working life, they are at risk of “going back into the closet”, Owles believes. Luckily for Owles, three days into a new City job with Hogan Lovells, she attended a huge LGBT+ event hosted by the firm: “I was suddenly surrounded by people who were out and being celebrated in a positive way”. 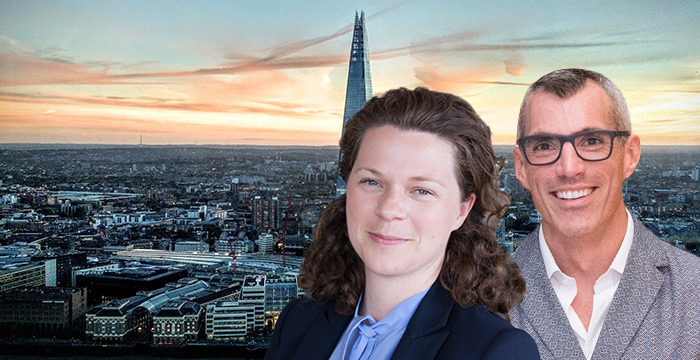 Plus, seeing other LGBT+ lawyers progress through the firm was encouraging for Owles, who is now partner in the firm’s corporate real estate team and co-chair of Hogan Lovells’ UK Pride network. It highlighted for her that success and authenticity weren’t mutually exclusive. Central to an accepting and open culture where LGBT+ lawyers feel confident they can be their authentic selves is the presence of LGBT+ role models. When Goldman Sachs executive director and senior legal counsel, Tuvia Borok, first qualified nearly twenty years ago, such role models were scarce, especially in the legal profession. Instead, there was an assumption that all male lawyers were straight and married, and probably with kids. “No one talked about diversity, there was no thinking around such progress and chances of being discriminated against for being different were very high,” he recalls. Office culture back then would often include the commonplace use of homophobic comments. Now, Borok, who is openly gay, takes it upon himself to be the role model absent during the early stages of his career. Although stressing he is a “lawyer that happens to be gay rather than a gay lawyer”, Borok finds that being open about his sexuality in the workplace encourages others to be comfortable with their own identity. Being someone that people can relate to is especially important: “I understand what you’re going through because I’ve been there and we’ve walked in the same shoes — and that’s really powerful to feel some commonality,” he explained. LGBT+ lawyers themselves are not the only ones benefitting from role models. Through reverse-mentoring, Borok has also spent time with senior members of firms seeking advice on how to confidently approach sensitive LGBT+ topics — from sexuality to the correct pronoun to use. As a gay single adoptive parent, for example, Borok often gets asked how he came to have a child. Questions, although not asked with malice, he says, can come across insensitively and inappropriately for the workplace. Through reverse mentoring, Borok adopts an “open and blunt” approach to discussing the right language to use, how to respond to unexpected answers, when to apologise and when not to. The importance of role models, and being authentic, is at the centre of the Goldman Sachs Legal Insight Programme, a four-week rotational programme for first-year LBGT+ law students founded by Goldman Sachs, alongside Hogan Lovells, accountancy outfit EY and hospitality giant Hyatt. Participants spend time with each City-based organisation shadowing, amongst others, the LGBT+ professionals within them. Through this it is hoped their fears of discrimination will be dispelled. The programme is designed to reinforce the belief that firms, like Hogan Lovells, are not aiming to recruit “cookie-cutter candidates”, but instead recognise that there is no one-size-fits-all lawyer, Owles stresses. Borok agrees and adds that the programme is important because often with only fancy brochures and websites to go by, aspiring lawyers have to witness this in action before they actually believe it. “We realise ‘seeing is believing’ and we want LGBT+ students to see they do not need to hide their authentic selves to be a success in the City,” he says. The programme, which will commence this summer, hopes to create a City network for top LGBT+ talent and equip participants with key skills they can share with their fellow students. This isn’t the first LGBT+ network that Hogan Lovells has been part of launching — it is one of 14 firms participating in the annual DiverCity In Law City law graduate recruitment initiative for LGBT+ candidates. It is hoped that as the legal profession continues to evolve and become more diverse, such LGBT+ initiatives will become redundant, Owles says. That being said, networks should be understood as fluid — adapting to the changing needs of the lawyers themselves. As Borok explained, while LGBT+ lawyers may initially seek support in being authentic, later down the line other pressures may arise, such as starting a family.